In the wake of Nike's exit from golf, Rory McIlroy has shocked the establishment by signing a new 14 club deal with Spalding. The deal believed to be worth in the region of $150 for a complete set including woods and will run for three years or until the heads fall off. Rory McIlroy will use his new Spalding clubs at the Fed Ex Cup playoffs. 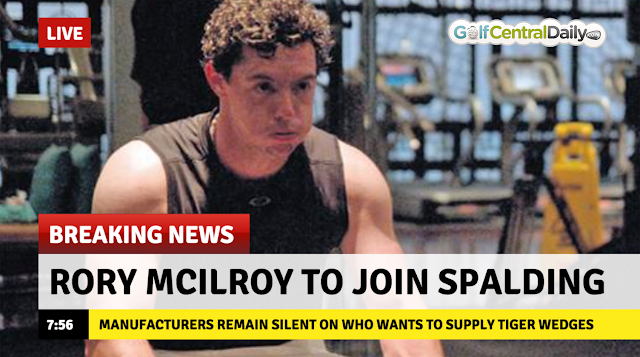 At a press conference to make the announcement McIlroy reacted angrily to suggestions that Spalding were a cut price brand of questionable quality and that he overlooked TaylorMade, Callaway and Ping in the decision process. "I don't think it was as difficult a decision for me," said McIlroy. "I don't feel like I've let the game down at all. I didn't get into golf to try and grow the game. I got into golf to try to win championships and win major championships and I believe I can do that with Spalding clubs and the new Limestone CaCO3 Spalding distance ball. I'm very happy with the decision I made, and I have no regrets about it." Spalding boss Tim Spall couldn't hide his shock and delight at the coup. "We are delighted to have Rory McIlroy on board," Spall told reporters. "Rory is already working with our design team on ways to stop the shafts getting all rusty and how to glue on the badge at the back a bit better." McIlroy finished the announcement with a thinly veiled swipe on the big equipment brands by saying he probably wont even browse through them in the golf shops anymore. "I'll probably walk past them but I wont be picking out the 7-iron to give it a waggle," he said. So what will you be looking at, Rory? "Slazenger, Benross, Spalding, Masters... the stuff that matters."